This European Community Biomedicine and Health Research–supported, multicenter, randomized, placebo-controlled, double-blind trial investigated the effect of an angiotensin-converting enzyme inhibitor (ACE-I) in children and young people with IgA nephropathy (IgAN), moderate proteinuria (>1 and <3.5 g/d per 1.73 m2) and creatinine clearance (CrCl) >50 ml/min per 1.73 m2. Sixty-six patients who were 20.5 yr of age (range 9 to 35 yr), were randomly assigned to Benazepril 0.2 mg/kg per d (ACE-I) or placebo and were followed for a median of 38 mo. The primary outcome was the progression of kidney disease, defined as >30% decrease of CrCl; secondary outcomes were (1) a composite end point of >30% decrease of CrCl or worsening of proteinuria until ≥3.5 g/d per 1.73 m2 and (2) proteinuria partial remission (<0.5 g/d per 1.73 m2) or total remission (<160 mg/d per 1.73 m2) for >6 mo. Analysis was by intention to treat. A single patient (3.1%) in the ACE-I group and five (14.7%) in the placebo group showed a worsening of CrCl >30%. The composite end point of >30% decrease of CrCl or worsening of proteinuria until nephrotic range was reached by one (3.1%) of 32 patients in the ACE-I group, and nine (26.5%) of 34 in the placebo group; the difference was significant (log-rank P = 0.035). A stable, partial remission of proteinuria was observed in 13 (40.6%) of 32 patients in the ACE-I group versus three (8.8%) of 34 in the placebo group (log-rank P = 0.033), with total remission in 12.5% of ACE-I–treated patients and in none in the placebo group (log-rank P = 0.029). The multivariate Cox analysis showed that treatment with ACE-I was the independent predictor of prognosis; no influence on the composite end point was found for gender, age, baseline CrCl, systolic or diastolic BP, mean arterial pressure, or proteinuria. There are very few randomized, controlled trials (RCT) in IgA nephropathy (IgAN), even though it is the most common glomerular disease worldwide (1–3). In the past decade, angiotensin-converting enzyme inhibitors (ACE-I) have raised great hopes of successfully treating chronic renal disease; they show beneficial effects not only in controlling hypertension but also in reducing the process of renal sclerosis (4–5). Several multicenter RCT have given evidence of protection against functional deterioration in unselected nephropathies, particularly in patients with severe proteinuria (6). However, the only published subanalysis of patients who had IgAN and were enrolled in a large RCT failed to prove a specific benefit for IgAN of ACE-I against progression toward renal failure (7). Although a favorable effect of ACE-I in IgAN was reported in some retrospective studies, particularly in hypertensive patients (8), and the pure antiproteinuric effect was demonstrated particularly in short-term studies (9), the benefits of ACE-I on IgAN progression has been only recently reported by an RCT that was not placebo controlled and that enrolled a limited number of adult patients from a single center. We report herein the results from our IgA Nephropathy and ACE Inhibitors (IgACE) trial, a European Community Concerted Action of Biomedicine and Health (10), which is a placebo-controlled, multicenter RCT that investigated in children and young people who presented with IgAN the effects of ACE-I on renal function decline and proteinuria. This trial enrolled young patients (3 to 35 yr of age) with a very constant level of moderate proteinuria (>1 and <3.5 g/d per 1.73 m2 during the 3 mo before the follow-up phase) and normal or moderately reduced renal function (creatinine clearance [CrCl] >50 ml/min per 1.73 m2). This IgACE trial provided the information, for the first time on a placebo-controlled basis, that ACE-I treatment is of benefit in reducing the progression of renal damage in young patients with moderately proteinuric IgAN. The IgACE study was designed in 1995 as a randomized, double-blind, placebo-controlled, multicenter trial using an ACE-I (benazepril) in young patients who had IgAN and were at risk for progression as a result of persistent proteinuria >1 g/d per 1.73 m2 (10). Criteria to enter the run-in phase were biopsy-proven IgAN (6) in patients who were aged 3 to 35 yr, proteinuria 1 to 3.4 g/d per 1.73 m2, and CrCl >50 ml/min per 1.73 m2; all of these data had to be constant during the preceding 3 mo. The exclusion criteria were Henoch-Schoenlein purpura nephritis; lupus; celiac disease; chronic liver disease; diabetes; pregnancy or unwillingness to avoid pregnancy; hypertension that exceeded 140/90 mmHg in adults and the 95th percentile in children (despite treatment with drugs other than angiotensin inhibitors); and any treatment with steroids, cytostatic drugs, or ACE-I during the preceding 6 mo. The study received the approval and funding for Concertation by the European Community as EEC Biomed Project BMH4-97-2487 (DG 12-SSMI) in December 1997 (10). The drug (benazepril) and the placebo pills were made available by Novartis in December 1998. At that point, the trial was redesigned to last from 1998 to 2004 and, because it was no longer considered ethical to refrain from treating patients with nephrotic-range proteinuria, the new protocol included the exit from the study not only for patients with worsening renal function but also for patients with proteinuria that increased up to ≥3.5 g/d, both being assumed as indicators of renal disease progression. The trial was proposed to patients for 3 yr, with a possibility of a 1- to 3-yr extension upon written consent. The eligible patients were randomly assigned after a minimization adaptive algorithm (A.P., University of Padua) for treatment with either drug (benazepril 0.2 mg/kg) or placebo, both provided in coded bottles by Novartis (which had no other role in the study design, performance, or reporting). Because of the blind design of the study, which was placebo controlled, no increase in drug dosage was conceivable. Hypertension was controlled using non-angiotensin antagonists. Patients were examined at 1, 3, and 6 mo and then every 4 mo up to the end of the follow-up. Casual office BP and ambulatory BP (ABPM) were recorded, and data were sent to the Coordinating Centre, as well as urine and blood samples for centralized measurements, on a yearly basis and at the end of the trial. Patients who were ≤18 yr of age were considered children. Creatinine in sera and urine and urinary protein centralized measurements were performed by automated colorimetric kinetic assays (Jaffé or pyrogallol tests; interassay and interassay coefficients of variance <2.5% for each test). Estimated GFR (eGR) was calculated according to Cockcroft in adults (11) or Schwartz in children (12). Nephrotic-range proteinuria was considered to be ≥3.5 g/d per 1.73 m2. Hypertension was classified according to the international criteria in use when the IgACE trial was designed, considering in adults (13) BP ≥140/90 mmHg as hypertension, BP 130 to 139/85 to 89 mmHg as high-normal, and BP ≤129/84 mmHg as normotension, and in children BP ≥95th centile for height and gender as hypertension, BP between 90th and 94th centile as high-normal, and BP ≤90th centile as normotension (14). Mean arterial BP (MAP), obtained by the ABPM, was converted in children into exact SD scores (SDS) (15). The time to the loss of 30% of initial CrCl was the primary end point. Furthermore, we considered two secondary end points: (1) The time to either loss of 30% of CrCl or an increase in proteinuria of ≥3.5 g/d per 1.73 m2 and (2) the remission of proteinuria measured as the time to a partial remission (proteinuria <0.50 g/d per 1.73 m2 over at least 6 mo) or to complete remission (proteinuria <0.16 g/d per 1.73 m2 over at least 6 mo). The sample size was calculated from the difference in survival to the loss of ≥30% of the initial GFR value (exponential time-to-failure distribution with constant hazard rate). The calculated sample size of 122 patients (61 in either group) was based on a one-sided significance level of 0.05, a statistical power of 80%, a dropout rate of 10%, and an expected event rate of 3.33% per year in the placebo group versus 0.83% in the active drug group. No interim analysis was planned. Data were analyzed on an intention-to-treat basis. Results of continuous variables were expressed as mean and SD or as median and range for normally distributed and non-normally distributed data, respectively. For unpaired or paired statistical analysis, t test or Mann-Whitney/Wilcoxon tests were used, for normally and non-normally distributed variables, respectively. The χ2 test was used for analysis of frequencies. Outcomes were compared by univariate survival analysis using the Kaplan-Meier method for estimation of survival to end points and the log-rank test (Breslow’s test). Multivariate survival analysis was performed with a Cox regression model to test the independent prognostic value of the following baseline covariates: gender, age, renal function, hypertension, proteinuria, and treatment. P < 0.05 was considered statistically significant. The low level of statistical power in the multivariate model allowed the detection only of predictors with large effects. The analyses were made using SPSS statistical software (version 13; SPSS, Chicago, IL). Between November 1998 and December 2003, 129 patients from 23 European centers of nephrology and pediatric nephrology in Italy, France, Germany, Sweden, and Portugal (as listed in the acknowledgments) were considered eligible for the study and entered the run-in phase of 3 mo, which aimed to assess the constancy of proteinuria (Figure 1). BP was checked at least three times and treated to achieve the BP goal (<140/90 mmHg for adults  and <95th centile for height in children ), by regimens that avoided angiotensin antagonists. During the run-in-phase, 23 patients were found not to be eligible: in 13 patients, proteinuria decreased below 1 g/d per 1.73 m2 and in four patients, it increased over the nephrotic range; and in three, BP was not sufficiently controlled by conventional drugs and the patients wanted to use ACE-I. An additional three patients were lost during the run-in phase; 40 patients did not sign the written consent. The remaining 66 eligible patients who accepted the placebo-controlled design were randomly assigned. The patients who entered the follow-up were 9 to 35 yr of age: 31 (46.9%) of 66 were ≤18 yr of age; most of them (27 of 31) were between 13 and 18. The first urinary symptoms developed at a median patient’s age of 14 yr (range 2 to 34 yr); therefore, in most of the patients enrolled (48 [73%] of 66) IgAN had originated in the pediatric age. Renal biopsy was performed at variable times before enrolment (median 2.8 yr; range 0 to 16). A history of recurrent gross hematuria was reported in 48% (32 of 66) of the patients. Male patients were more frequent (48 of 66). When the codes were broken at the end of the trial, it emerged that 32 patients had been assigned to benazepril treatment (ACE-I group) and 34 to placebo (Figure 1). All nine patients who were lost after randomization turned out to belong to the ACE-I group, and this was probably due to chance, because none complained of any adverse effects, and the explanation given was that they were afraid that they might not be taking the active drug. The baseline demographic, clinical, and laboratory characteristics of the two randomized groups were remarkably similar (Table 1), and the loss of the nine patients after randomization did not significantly modify the balance between the ACE-I and placebo groups (data not shown). Also, the baseline features of the subgroup of 31 pediatric patients were similar as between the ACE-I and the placebo groups (Table 2). The majority of patients (57 [86.4%] of 66) had normal renal function (CrCl ≥90 ml/min per 1.73 m2), and the remaining nine (13.6%) of 66 had CrCl between 60 and 89 ml/min per 1.73 m2. All of the children but one who entered the IgACE trial had normal renal function. Mean proteinuria at baseline was 1.74 ± 0.73 g/d per 1.73 m2. Most of the patients had proteinuria >1 and <2.5 g/d per 1.73 m2 at the start of the trial. Twelve (21%) patients entered the study with subnephrotic proteinuria (2.5 to 3.5 g/d per 1.73 m2), with similar frequency in adults and children. According to the international criteria in use when the IgACE trial was designed in 1995 to 1997 (13,14), most patients were normotensive, and only five (7.6%) of 66 (one of whom was a child) were hypertensive. During the time of the follow-up, the criteria for hypertension changed (16,17), and according to these new limits, a slightly higher prevalence of hypertensive patients was detectable at start-up (nine [14%] of 66, one of whom was a child); none of these changes was significantly different. MAP measured by ABPM had a mean value in adults of 94.00 ± 7.1 mmHg. In children, MAP-SDS according to height and gender had a mean value of 0.39 ± 1.04. Both means were within the reference limit of the literature (17). There were no significant differences at baseline in systolic (SBP) or diastolic BP (DBP) and MAP values as detected by ABPM between ACE-I and placebo groups, either when taking into account the criteria in use at IgACE trial design or when considering those that have now been adopted. Three adults were mild smokers (3 to 5 cigarettes/d), and five patients consumed one to two glasses of wine or up to 500 ml of beer without any relevant difference in distribution among treatment and placebo groups. According to the intention-to-treat analysis, the median duration of follow-up was 38 mo (up to 58 mo), and it was similar in ACE-I and placebo groups (Table 1). After the loss of nine patients within the first 3 mo from randomization, 57 patients remained in follow-up for a median of 42 mo. The proposed study period of 36 mo was reached by 38 patients, and it was further extended in 34 patients upon their written consent (16 patients turned out to be in ACE-I group and 18 in placebo group). An additional 10 patients entered the study during the last years of enrollment, and at the end of the trial, their follow-up ranged from 16 to 32 mo. The other nine patients with follow-up of <3 yr quit the study because they had reached the end point (seven patients), got pregnant (one patient), or died in a car accident (one patient). The mean levels of CrCl in the two groups were similar at baseline (116.0 ± 24 ml/min per 1.73 m2 in ACE-I group and 113.5 ± 19 ml/min per 1.73 m2 in the placebo group), whereas at the end of the follow-up, the CrCl was significantly higher in the ACE-I group (124.0 ± 31 ml/min per 1.73 m2) in comparison with the placebo group (109.3 ± 29.8 ml/min per 1.73 m2; P = 0.03). Mean levels of proteinuria significantly decreased in the ACE-I group (from 1.61 ± 0.70 to 0.94 ± 0.98 g/d per 1.73 m2 at the end of follow-up; P = 0.002), whereas they only slightly diminished in the placebo group (1.87 ± 0.74 g/d per 1.73 m2 at start versus 1.80 ± 1.34 g/d per 1.73 m2 at the end of follow-up; NS). Proteinuria decreased significantly by the first year in the ACE-I group (0.96 ± 0.68 per 1.73 m2 after 1 yr; P < 0.001). No significant differences in BP measurements were observed between the two study groups during the years of follow-up (Figure 2). At the end of follow-up, mean levels of SBP were 121.0 ± 8.4 mmHg in the ACE-I group and 124.4 ± 13.5 mmHg in the placebo group (P = 0.143); mean DBP levels were 73.7 ± 6.7 mmHg in the ACE-I group and 76.7 ± 8.5 mmHg in the placebo group (P = 0.06; NS). ABPM MAP crude values in adults and ABPB MAP SDS for height and gender in children showed some minor changes during follow-up in both ACE-I and placebo groups (Figure 2, C and D). At the end of the follow-up three (9.3%) of 32 patients in the ACE-I group versus 11 (32.3%) of 34 patients in the placebo became hypertensive and so needed additional treatment. These figures were similar when adopting the new criteria (16,17): Four (12.5%) of 32 in the ACE-I group and 12 (35.3%) of 34 in the placebo group, respectively, were classified as hypertensive; none of these changes was significantly different. BP data during the IgACE trial in ACE-I treated patients and in the placebo group. (A) Mean levels and standard deviations (SD) of systolic BP (SBP). (B) Mean levels and SD of diastolic BP (DBP). (C) Ambulatory BP circadian mean arterial values (ABPM MAP) in adults. (D) ABPM MAP SD scores (SDS) for height and gender in children. One adult patient (one [3.1%] of 32) in the ACE-I group and five in the placebo group (five [14.7%] of 34; four adults and one child) reached the primary end point of a 30% decrease in CrCl (Figure 3); they all belonged to the intermediate-grade proteinuria group (between 1.5 and 2.5 g/d per 1.73 m2; Figure 4). The patient in the treatment group reached this end point after 20 mo and those on placebo after 11, 28, 36, 38, and 48 mo, respectively (median 36 mo). The survival curve showed that the progression of renal damage in the ACE-I treatment group tended to be slower than in the placebo group but without attaining a significant difference, possibly because the trial was underpowered as a result of the limited number of patients (log-rank test, P = 0.180; Figure 3). Survival without end point of 30% reduction of baseline CrCl in IgAN patients receiving ACE-I or placebo (Kaplan-Meier estimates, log rank, P = 0.180). Proteinuria levels at baseline and at end of the IgACE trial. Proteinuria grade 1.0 to 1.5 g/d per 1.73 m2: dotted line with □; proteinuria grade 1.5 to 2.5 g/d per 1.73 m2: continuous line with ▪; proteinuria grade 2.5 to 3.5 g/d per 1.73 m2: dashed line with *. Composite End Point of Decrease in CrCl by 30% and/or Increase of Proteinuria up to the Nephrotic Range. This combined end point of progression of renal damage was reached in one (3.1%) of 32 patients in the ACE-I group and in nine of (26.5%) 34 in the placebo group, and the difference was statistically significant (log-rank test; P = 0.034; Figure 5). Three patients developed both nephrotic-range proteinuria and >30% reduction in CrCl (one in the ACE-I group). Four patients, all in the placebo group, contributed to the composite end point with increase in proteinuria up to ≥3.5 g/d per 1.73 m2 without relevant CrCl modification after 3, 16, 24, and 32 mo, respectively. The baseline proteinuria of all of these patients was very variable (Figure 4). Survival without the combined end point of 30% reduction of baseline CrCl and/or increase in proteinuria up to >3.5 g/d/ 1.73 m2 in IgAN patients receiving ACE-I or placebo (Kaplan-Meier estimates, log rank, P = 0.034). 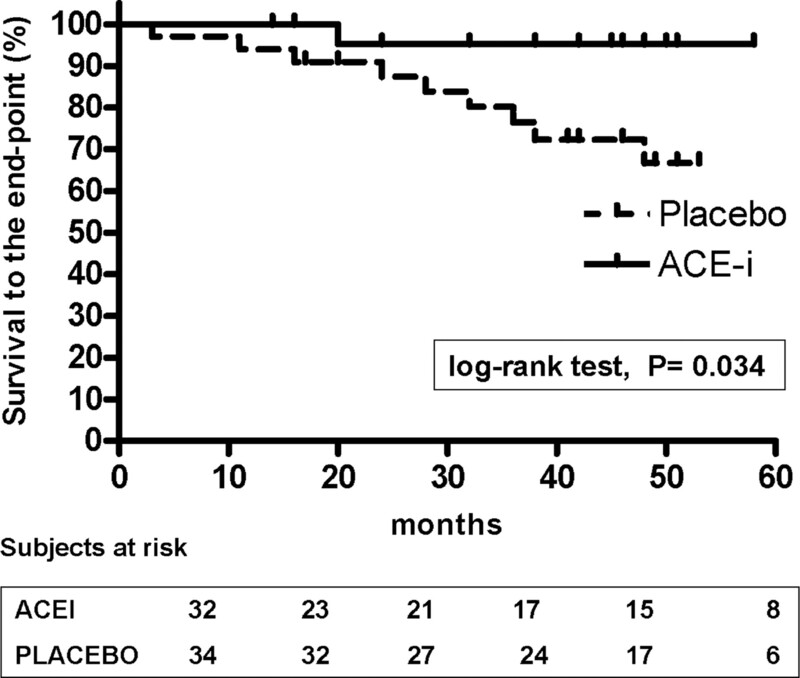 Cox multivariate survival analysis demonstrated that treatment with ACE-I was the independent predictor of good prognosis and survival to the combined end point. No influence on the progression of renal damage was found for gender, age, baseline CrCl, SBP, DBP, MAP, and proteinuria (Table 3). We also reanalyzed the data on a per-protocol basis, and both log-rank and Cox analyses gave results that were remarkably similar to those that were obtained by the intention-to-treat basis and reported herein. End Point of Remission of Proteinuria. Partial remission of proteinuria to values <0.5 g/d per 1.73 m2 was experienced in 13 (40.6%) of 32 patients (seven adults and six children) of the ACE-I treatment group and in three (8.8%) of 34 (one adult and two children) of the placebo group, and the difference was highly significant (log-rank, P = 0.0002; Figure 6A). The patients in the treatment group who went into remission had a stable decrease in proteinuria after a median of 20 mo (1 to 58 mo) and those in the placebo after a median of 32 mo (31 to 33). Among these patients, a complete remission of proteinuria that lasted >6 mo was detected in four (12.5%) patients in the ACE-I group (after 3, 12, 12, and 36 mo) but in no patient in the placebo group (log-rank, P = 0.015; Figure 6B). Proportion of IgAN patients receiving ACE-I or placebo who reached end point of (A) partial (proteinuria <0.50 g/d per 1.73 m2, P = 0.0002) or (B) complete (proteinuria <0.160 g/d per 1.73 m2, P = 0.0150) remission of proteinuria (Kaplan-Meier estimates, log rank). Among the 31 pediatric patients, partial remission of proteinuria was observed in six (50%) of 12 in the ACE-I group and in two (10.5%) of 19 in the placebo group. A complete remission of proteinuria was detected in two of 12 children in the ACE-I group and in none in the placebo group. No patients from the high-grade proteinuria, either in the ACE-I or in the placebo group, went to remission (Figure 4). Benazepril did not induce major adverse effects: only one child had a temporary cough, and no other adverse effects were experienced. One patient became pregnant despite the contraceptive methods adopted. The sealed envelope that contained the code was opened, and she interrupted her pregnancy because she was found to be in the treatment group. One patient died in a car accident after 16 mo of trial. No patient entered dialysis treatment. In children and young people with IgAN and moderate proteinuria, the treatment with ACE-I proved to be effective in reducing the progression of renal damage assessed as a combined end point of decrease in baseline CrCl by 30% and/or increase in proteinuria up to the nephrotic range. This secondary outcome turned out to be statistically significant as a result of the large difference (3.1 versus 26.5%), despite the limited number of patients in the study, which underpowered the IgACE trial in detecting the primary outcome of reduction in baseline CrCl by >30%. The difficulties that were met over enrolling patients with IgAN in our trial derived from a claim, launched by the medical media in that period, that maintained that ACE-I could be the solution for every renal disease (4,5). However, this was only partially true and for IgAN was not supported by evidence-based medicine (18,19). Because proteinuria above the nephrotic range was reported in every study to be a risk factor that was significantly associated with accelerated progression to renal failure (20), the revised IgACE protocol included a combined secondary end point that induced nephrotic patients to quit the trial. The multivariate analysis showed that treatment was the only independent predictive factor of favorable outcome. The result was independent of BP values; however, it is conceivable that small differences in BP, although not influencing the outcome of the trial during the 38 mo of median follow-up, may nevertheless be important in the long run. A thorough analysis of the relative effect of strict BP control versus the antiproteinuric effect was, however, beyond the scope of this research. The benefits were further emphasized by the definite and stable reduction in proteinuria that was observed in the ACE-I group, with remission to values <0.5 g/d per 1.73 m2 (in 56.5% in the ACE-I group versus 8.8% in the placebo group) reaching in some cases values <0.160 g/d per 1.73 m2 (17.4% in the ACE-I group versus none in the placebo group), stable for >6 mo, indicating a regression of proteinuria. Such levels of proteinuria have never been found to be associated with a risk for progression of IgAN; therefore, they represent a truly successful end point. One strength of this study is that only stable patients were selected and confirmed over a 3-mo run-in phase, which is at variance with most studies on IgAN that enrolled patients shortly after the onset of clinical symptoms and renal biopsy (1,21). Despite these precautions, several patients, who were not as stable as expected, were excluded from entering the follow-up phase. The majority of the enrolled patients had developed significant proteinuria slowly over the years. This selection has the drawback of not permitting an analysis of the histologic features, because renal biopsy had often been performed a long time previously; however, we considered the advantages of analyzing a more limited cohort—but one with stable clinical features—to be of greater value. One might wonder whether there is still a need to prove that ACE-I are of benefit in proteinuric IgAN. The clinical benefits of ACE-I in renal diseases have been anticipated by a long and astonishing series of successes in experimental conditions in vitro and in animal diseases (reviewed in reference ) and have been demonstrated in unselected cohorts of patients with chronic renal diseases (4,5). Therefore, when ACE-I were demonstrated to be capable of reducing proteinuria after a few months of treatment in IgAN (9,23), most nephrologists thought that there was no longer any need for demonstrating the benefit, and ACE-I indeed became a first-choice treatment in proteinuric IgAN, even without hypertension or reduced renal function. Our group was one of the first to emphasize that in IgAN, particularly in proteinuric cases, there was a local hyperreactivity of the RAS (24), and a precocious activation of the RAS has recently been demonstrated (25). However, ACE-I induced a limited reduction in proteinuria (by 20 to 50% of the baseline values) in a subgroup only (40 to 60%) of IgAN (9,23), and it was not proved that this was enough for renoprotection, so leaving open the need for an RCT (19). While our enrollment was proceeding slowly, because ACE-I therapy was becoming a widely used treatment for patients with IgAN (even though not supported by evidence-based medicine), another group was performing an RCT in adults; this was published by Praga et al. (26) in 2003. Compared with this study, our report has the advantages of being a placebo-controlled study (this is the first placebo-controlled RCT in IgAN), of being multicenter based, and of having well-defined selection criteria. The only previously published trial of ACE-I in IgAN enrolled a smaller number of patients (only 19 in the control group and 20 in the treatment group had an appropriate follow-up); they also had different entities of proteinuria (from 0.5 to 5.3 g/d) and of renal function impairment, hence with a variable prognosis. In a single-center investigation, all patients are likely to be enrolled in the study, whereas the multicenter nature of our trial enabled us to achieve a very careful selection of patients. Moreover, we focused on young patients because we wanted to investigate a cohort of patients who lacked the effects of renal aging or environmental toxic exposure (e.g., smoking and alcohol consumption) and who were without severe hypertensive states. The therapeutic approach in IgAN when it is diagnosed in the pediatric age is particularly relevant, because the origin of IgAN has been said to date back in most cases to childhood (27). Indeed, considering the general progression rate of IgAN (25% of the cases need dialysis in 20 yr) and the age of patients who enter dialysis in Europe (25% are <30 yr of age at first dialysis) (28), it is clear that several cases of progressive IgAN began in childhood. No placebo-controlled RCT had been previously published on ACE-I in pediatric patients with IgAN. The IgACE enrolled young patients, with a peak age of 18 yr at enrollment, but it is of interest that 73% of the cases had manifested the first signs of IgAN during the pediatric age; therefore, most of the patients investigated had begun their clinical history as pediatric IgAN. The trial suffered from some limitations (e.g., the small number of patients enrolled), which rendered the trial underpowered to detect the primary outcome of a 30% reduction in GFR, and the high prevalence of a differential loss to follow-up, always in the treatment group, which might have resulted in a bias. However, the IgACE trial proved a significant benefit of ACE-I on the progression of IgAN when it was assessed as a composite end point of 30% reduction in GFR or an increase of proteinuria over the nephrotic range. The benefit of ACE-I on remission of proteinuria below what is generally considered a harmful level were highlighted as well. Within the range of proteinuria selected for enrollment, we failed to find any effect of baseline proteinuria, renal function, BP, or age on the final outcome. This trial was supported by the European Community (EC Biomed Project BMH4-97-2487 [DG 12-SSMI] in December 1996) and was performed under the auspices of the Italian Society of Nephrology (Gruppo di Studio Adulto-Bambino) and of the Italian Society of Pediatric Nephrology. The trial is registered in the European Register of Clinical Trials on Medicines for Children (DEC-NET) with the serial number IT448. The register is accessible at www.dec-net.org. The trial was carried out thanks to the combined collaboration of many nephrologists and pediatric nephrologists who included their patients in the trial and provided highly relevant support to the authors by carefully following up their clinical course: G. Rattalino (Torino, Italy), D. Roccatello (Torino, Italy), S. Ferrero (Asti, Italy), A. Edefonti (Milano, Italy), S. Carozzi (Savona, Italy), M. Dugo (Treviso, Italy), G. Petri (Crema, Italy), G. Massimetti (Pisa, Italy), G. Lavoratti (Firenze, Italy), G.F. Rizzoni (Roma, Italy), G. Lama (Napoli, Italy), C. Pecoraro (Napoli, Italy), G.B. Capasso (Napoli, Italy), S. Maringhini (Palermo, Italy), S. LiVolti (Catania, Italy), P. Cochat (Lyon, France), R. Stone (Lisboa, Portugal), T. Linnè (Stockholm, Sweden), J.B. Palcoux (Clermond Ferrand, France), D. Weitzel (Wiesbaden, Germany), M. Soergel (Marburg, Germany), and K. Timmermann (Dresden, Germany). We thank Carmine Zoccali for advice and discussion. The valuable help of the young residents Luca Roasio, Roberta Camilla, and Domenico Mancuso, as well as the help of Bibiana Scelfo and Monica Chiesa was highly appreciated. See the related editorial, “Is Proteinuria Reduction by Angiotensin-Converting Enzyme Inhibition Enough to Prove Its Role in Renal Protection in IgA Nephropathy?” on pages 1633–1634.